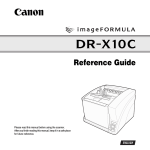 WU10 Wi-Fi unit for the Canon imageFORMULA DR series. the scanner to be connected. 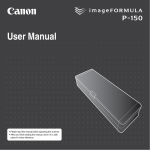 ● imageFORMULA is a trademark of CANON ELECTRONICS INC.
of Microsoft Corporation in the United States and other countries. the wireless communication functions in the following conditions. pacemaker. The radio waves may affect pacemaker operation. appropriate medical institution before use. institutions such as hospitals, or near electronic medical equipment. with any medical institution before using it inside their facilities. ● Do not use the wireless communication functions inside aircraft. could cause a malfunction resulting in serious accident. at least 20 cm from your body. using, be aware of the following. * Outdoor use is prohibited in Italy. LP-E10 Battery Pack Users Guide for battery handling information. when it is connected to a scanner via USB cable. environment, it can be used by any computer in the same network. The network mode must be selected before turning on the device. connected via USB cable to this device also turns on. Connect the supplied AC adapter here. The following lamps indicate the device state. Selects the device’s network mode. device to an access point. Utility on the Setup disc must be installed on a computer. This unit supports the following scanners (as of October 2012). on supported models, visit the Canon support website. 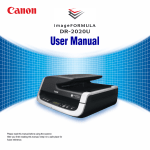 using this software, visit the Canon support page. Also connect this device to an outlet using the supplied AC adapter. where no nearby outlet is available. charging takes about 2.5 hours. Connect the device to an access point or directly to a computer according to the network environment. Depending on the device that will be connected to the scanner via Wi-Fi, you can change the network mode of the scanner as follows. scanner to connect to the computer. your computer’s wireless connections feature. made using the WPS feature. • When using a Wi-Fi connection, scanning is slower than with the USB connection. device, so unless the mode has been changed, use the following procedure to search and connect to the computer. Check the SSID of this device. The SSID is printed on the device’s bottom label. power button to turn the device on. Enable the wireless LAN function of the computer. This step is not necessary if the wireless LAN function is already enabled. ➔ Skip to step 4. A Click the Start button - [Control Panel] [View network status and tasks]. B Click [Change adapter settings]. to close the settings screen. Search for the wireless network, and establish Wi-Fi connection with the device. C Enter “canonwu10” for the security key in the screen that appears, then click [OK]. from step 1 in the list. Start the Scanner Wireless Connection Utility. in the task bar or Dock. computer, install it by referring to the P. 6. Wireless Connection Utility] in that order. Select the system drive (such as [Macintosh HD]) – [Applications] in the Finder, then doubleclick [Scanner Wireless Connection Utility]. Verify whether the device can properly connect to the computer. connected” appears for the device in the list. to the desired computer or smart device. to AP mode under factory default settings and must be switched to Station mode before using the WPS function. • Even a WPS-equipped access point may have WPS disabled. Ensure WPS is enabled. • If the access point is using security settings (such as MAC address filtering), change the settings to allow connection to this device. • To ensure good Wi-Fi communications, perform this procedure with the scanner initially located close to the access point. This step is not necessary if the wireless LAN function is already enabled. ➔ Skip to step 3.
lamp blinks green (about 3 to 10 seconds). See the instructions for your access point. • Allow some time for the required WiFi settings to be configured. configure the device’s network settings to suit the network environment. Display the Web configuration page for the device. B Click [Scanner Server Properties]. The Web configuration page is displayed. Configure settings in the Web configuration page for the device. F Close the Web browser. H Power off the device by pressing its power button. button to turn the device on. A Click [Wireless LAN] under [Station Conf.]. B Enter the user name and password, then click [OK]. C Select one of [2.] to [5.] under [Wireless LAN Setting List]. the access point you are using. SSID: Enter the SSID of the access point. Shared, WPA, etc.) configured for the access point you are using. is still open, click [OK] to close it. the settings again from step 1.
disconnect request is received. Click [Yes] to disconnect. operating settings on the connected device. The properties screen has three tabs. This device’s information is displayed. The following operations can be performed on this tab. connects to the device via Wi-Fi. check box under [Auto Connect] is normally kept selected. a request is received can be specified from 10 to 180 seconds. remote restart and status monitor are available. There are two ways to display the Web page as described below. appear, click [Scanner Server Properties]. the IP address needs to be configured. The default Web browser starts and the Web page is displayed. The user name and password are required to configure the settings. bar of the Web browser and then press the ENTER key. address of this product are displayed. Shows the operating status of this product. the product, and updates the firmware. This section explains the Status pages. USB devices connected to it. If you click [System] on the left menu, the page below is displayed. This page shows the operating status of this product. WIf you click [Device] on the left menu, the page below is displayed. used, “Not Connected” is displayed. was connected to this product. item appears only in Station mode. Displays the IP address of a WINS server. If you click [Wireless] on the left menu, the page below is displayed. This page shows the wireless operating status of this product. This section explains the Network Configuration pages of this product. If you click [General] on the left menu, the page below is displayed. In this page, you can configure the host name and network mode. appears only in Station mode. Set the IP address of the gateway. If you click [TCP/IP] on the left menu, the page below is displayed. In this page, you can configure the IP address. Set the IP address of this product. obtained from it will be applied. improved by changing the channel. Select from channels 1 to 13.
connecting to a wireless LAN. This section explains the [Access Point Conf.] pages. Set the SSID of this product. must share the same SSID. mode, WEP can be used. setting is not used for this mode. point, etc.) you wish to connect to. you build a wireless network. This section explains the [Station Conf.] pages. Set the start IP address. Set the end IP address. devices with the same WEP key. using the settings for “WEP Key 14” and “Key Index”. you wish to use for encryption (14). value if the key size is 128 bit. “Access Point Configuration” (p. 33). This section explains the Security pages. If you click [Password] on the left menu, the page below is displayed. configuring the settings in a Web browser. input for the access point. settings in a Web browser. Used to confirm the password. If you click IP Filter on the left menu, the page below is displayed. from a range of registered IP addresses. Set the IP address access filter. from the set IP address ranges. This section explains the Maintenance pages. restart this product, and update the firmware for this product. If you click [Restart] on the left menu, the page below is displayed. In this page, you can restart this product. To restart it, click [Yes]. path of the new firmware file (BINARY format) and then click [Update]. string printed on the bottom label. Also refer to the instructions for the access point being used. ● Confirm that the access point is operating correctly. ● Confirm that the mode switch is set to “ST”. back on, and attempt the Wi-Fi connection again. from other appliances can interfere with Wi-Fi signals. Keep Wi-Fi devices away from such appliances. correct SSID of the access point. period of inactivity, regardless of the Wi-Fi connection. I want to reset to the factory default settings. * Varies according to environmental conditions. of the software is with you. be responsible for any disputes arising from or related to the software or the use thereof. Also please write below information so that we can send you appropriate source code. reasonable security measures to protect your information. responsibilities for you if you distribute copies of the software, or if you modify it. true depends on what the Program does. at no charge to all third parties under the terms of this License. version, but may differ in detail to address new problems or concerns. should have at least the "copyright" line and a pointer to where the full notice is found. Floor, Boston, MA 02110-1301 USA. are welcome to redistribute it under certain conditions; type `show c' for details. other than `show w' and `show c'; they could even be mouse-clicks or menu items-whatever suits your program. the GNU Lesser General Public License instead of this License. new free programs; and that you are informed that you can do these things. responsibilities for you if you distribute copies of the library or if you modify it. reputation will not be affected by problems that might be introduced by others. the wherewithal to run that program using a modified version of the Library. must be combined with the library in order to run. License"). Each licensee is addressed as "you". work based on the Library (independent of the use of the Library in a tool for writing it). copy of this License along with the Library. of derivative or collective works based on the Library. wish.) Do not make any other change in these notices. that is not a library. copy the source along with the object code. 6 states terms for distribution of such executables. is not precisely defined by law. under Section 6, whether or not they are linked directly with the Library itself. that component itself accompanies the executable. the terms of the Sections above. responsible for enforcing compliance by third parties with this License. both it and this License would be to refrain entirely from distribution of the Library. public, we recommend making it free software that everyone can redistribute and change. terms of the ordinary General Public License). ** Copyright 1995,1998,1999,2000,2001 by Jef Poskanzer <[email protected]>. Copyright 2012 by CANON ELECTRONICS INC. All rights reserved. each sales region of the Document Scanner. d’exposition aux fréquences radioélectriques (RF) CNR-102 de l’IC. des extrémités: mains, poignets, pieds et chevilles). The FCC ID can be found on the label on the underside of the unit. This equipment complies with the essential requirements of the European Union directive 1999/5/EC. Approvato esclusivamente per l’uso in locali chiusi.